Zoe - your emails have been bouncing back for two days just in case you didn't know. Sal is now home. He is on the pink stuff - TMS for 10 days every 12 hours. He has about 12 staples on this tum that will be removed in 2 weeks. I don't like the staples - they look so uncomfortable. I'm worried that they are going to pop off. Those staples aren't going anywhere. Do all boars produce these gigantic poops? I've noticed that Elvis lays a few down every day. Briana, I hope Sal does really well. That looks like a nice, clean incision. We had an indepth discussion once, with pictures. Apparently those devils (the boars) do produce long poops. I think it's to enable more variety in designing jewelry. Briana, can I copy your pic to the forum? Lynx - Yes feel free to copy the picture. Wow! 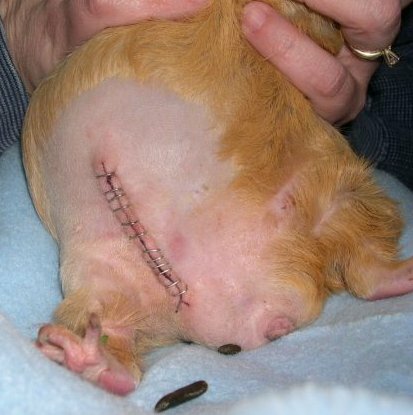 What a big incision! It looks nice and clean. Aww, poor little guy. I sure hope he's doing better. Thanks, Briana. I cropped it so it would take less room (it's in your original thread now). Those staples have never bothered my guys and they are so easy to take out with the special staple remover. Dr. Murray does a nice job, eh? If I hadn't found Dr. Murray, I probably wouldn't have gone so gung-ho on the guinea pig herd here. Before him, it was so sketchy going to the vets... and they always ended up trying to get him on the phone anyway for a consultation. I went through hell will Zoe, for years... worrying about if I was getting her issues properly diagnosed and then treated efficiently. My compliments to Sal on his impressive poops. My girls make plump ones... but not so long! Hope the lab results come soon and give you good news! Sal lost a whole pound after his surgery. Do you think that is most likely because the mass was removed. He's been eating his pellets, veggies and drinking water. Just want to check. Briana, what is his current weight? His current weight is 1339 grams. On 2/25/2003 he was 1458. Difference of 119. Maybe he didn't loose and much as I thought. If he weighs 1339g, he weighs almost 3 lbs. That's still a big pig. I'm glad he's doing well Briana. Good job, Briana. I hope he recovers quickly. Those staples and the incision look great! Got the results from Murray and he said it was a mammary Endocarcinoma (??) malignant tumor. He said the pathologist said the margins are clean which I'm guessing mean that there are no signs that is had spread. He said that we're going to want to keep an eye on that area very closely. He is consulting with the pathologist and they're going to discuss if neutering would be beneficial. He also said that 30% of mammary tumors aren't benign and Sal happened to be in that 30%. After talking with pigpal I think I misheard Murray. I think it may be adenocarcinoma.